A bank has been forced to defend itself after a second employee at the same Kirkham branch was convicted of stealing from customers. Samantha Foster, 35, was this week handed a suspended jail term after breaching her position of trust at Barclays by targeting the accounts of two customers, aged 85 and 90. It comes after another employee at the same branch, Jilian Moss, 52, was jailed for 12 months in August last year for manipulating the accounts of two elderly customers to the tune of £14,500. Today, a spokesman for Barclays insisted staff fraud was “rare” despite two cases at the Poulton Street branch in less than six months. The spokesman said: “Barclays spends a great deal of time and money protecting the interests of our customers and ourselves against the actions of would-be fraudsters. “Customers should be reassured that if they fall victim to fraud on their account they are protected and won’t suffer financial loss as a result. “We employ tens of thousands of people in the UK and staff fraud is rare. 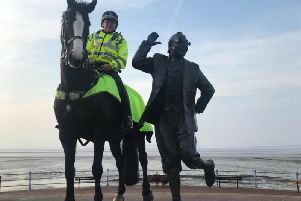 In the latest case, heard at Preston Crown Court, Foster, of Bideford Avenue, Blackpool, admitted two offences of theft totalling £12,000 – despite earlier claiming to police it made her “physically sick” that one of the victims could think she could do such a thing to him. Craig MacGregor, prosecuting, said the first offence dated back to March 2012. In that instance £4,500 was stolen from the ISA account of the 85-year-old. The victim was able to later recall the date of the offence because it was his wife’s birthday. In May 2012, £7,200 was withdrawn from the account of the 90-year-old man. Foster was arrested in July 2012. She was give six months prison, suspended for two years, with 120 hours unpaid work and told to pay £500 costs. “She is absolutely petrified about what will happen to her. “There hasn’t been a morning in the last two and a half years that she has not woken up and thought about what might happen to her”. In August last year, Moss, of Cedar Close, Newton, was jailed for 12 months after manipulating the two elderly customers. A court heard she had made banking errors but rather than admit them she tried to hide it by stealing from customers. Moss pleaded guilty to one charge of theft and two of false accounting. The case involved a total of £17,650.